The weather is warming up in America and so is the economy. U.S. unemployment fell to 5.3%, its lowest level since April 2008, according to the latest government data released Thursday. It was an even healthier rate than many economists predicted and brings America back to a rate last seen before the financial crisis. 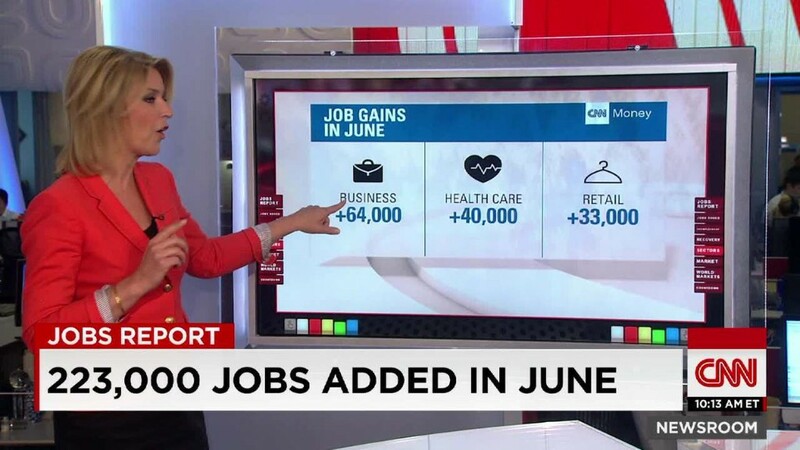 Hiring remains robust: the U.S. added 223,000 jobs in June. Thursday's news was slightly below the prediction from CNNMoney's survey of economists, which projected there would be 235,000 jobs added. There's just one major complaint for many: Where's the wage growth? Average hourly earnings rose only 2% annually in June -- still far below the goal for a healthy economy of 3.5% or more. There are also concerns about the labor force participation rate, which measures how many Americans are employed or looking for work. It hit a 37-year low in June. That means a lot of people aren't working or have given up trying to look for work. Some experts were less than thrilled with the jobs report. "I was set up to expect some 4th of July fireworks and instead I think we got a dud here," says Phil Orlando, chief economist at Federated Investors. The job gains for April and May were revised down. Important summer: Still, June's job strength is the beginning of an important summer for the economy. The U.S. is the growth engine for the world this year as many other nations slow down. After years of waiting, the Federal Reserve could raise interest rates in September for the first time since 2006. A rate hike would be a healthy sign that the economy is almost fully recovered from the Great Recession. Other economists saw the glass half full in June. "Yet another month of impressive job creation pushes the Fed closer to hiking interest rates later this year," says Chris Williamson, chief economist at Markit, a financial data provider. The catch: the economy needs to perform well between now and September. 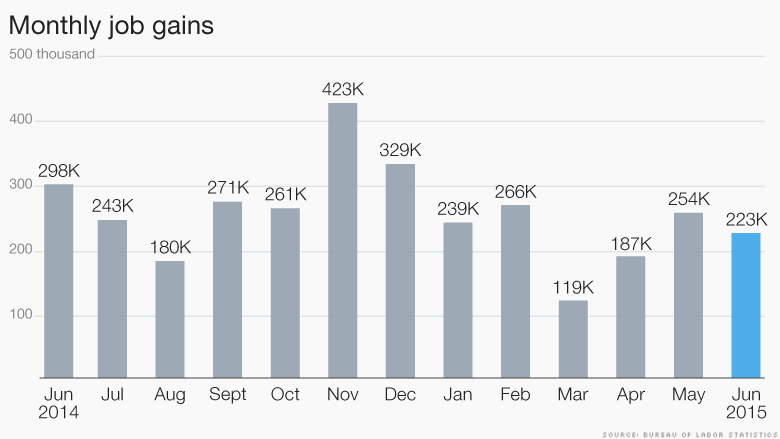 Jobs gains came across the board last month. Coming on the heels of the Supreme Court's decision to uphold the Affordable Care Act, health care gained 40,000 jobs in June. Hiring in professional and business services -- accountants, lawyers -- rose by 64,000 too. The job news comes right after another key development: Americans are picking up their spending. The personal consumption expenditure -- a measure of spending -- posted the best monthly rise in May since 2009, according to the Commerce Department. Still, the news wasn't all cheery. Wage growth remains well below where the Fed -- most Americans -- want it to be, and the number of people who work part-time jobs but want full-time jobs also remains very high at 6.5 million. These so-called involuntary part-time workers are a major concern for the economy and the Fed. There's hope that wages will rise since unemployment has been so low for several months now, but that pick up has yet to happen. Overall, June's job progress confirms what many experts have believed for months: after a winter set back, America is regaining momentum. "I'm fairly bullish on job growth for the remainder of the year," says Joe Huddle, executive vice president at DHR International. Share your story: Have you recently landed a job?